Reducing Seed Treatment Dust Off - Sentry Air Systems, Inc. The Guide to Seed Treatment Stewardship defines seed treatment as the application of biological organisms and chemical ingredients to seed to suppress, control, or repel plant pathogens, insects, or other pests that attack seeds, seedlings or plants. Seed applied technologies such as inoculants, herbicide safeners, micronutrients, plant growth regulators, seed coatings, colorants, etc. may also be applied to the seed. Treated seed is intended for planting only and not for food or feed uses. By treating seeds you are able to protect crops by decreasing the likelihood of weed species, harmful insects and numerous plant diseases to afflict crops. CropLife America — a crop protection association that represents the companies that develop, manufacture, formulate and distribute crop protection chemicals and plant science solutions for agriculture and pest management in the United States — lists five major benefits of crop protection chemicals. The United States Department of Agriculture has an in-house research branch called Agricultural Research Service. This branch has developed National Program 303: Plant Diseases. The goal of this program is to develop control strategies to reduce losses caused by plant diseases that are effective and affordable while maintaining environmental quality. Currently in the middle of their 2012-2016 Action Plan, this program has broken down their research into three main categories: 1. Diagnostics, Etiology, and Systematics; 2. Biology and Epidemiology of Plant Disease; and 3. Plant Health Management. The program hopes the impact of these research and outreach activities to improve plant health include the maintenance of abundant high quality crops for all citizens, productive agricultural and forest industries, and the healthy managed landscapes in our country. The Tool for Sustainable Agriculture developed by CropLife International and the International Seed Federation says the basis of good seed application techniques is to deliver the product to the seed at the correct dose and as uniformity as possible from seed to seed. Seed dressing is the most common technique where the seed is either dressed with a dry formulation or wet treated with a liquid formulation. Seed coating utilizes a special binder and formulation to enhance the adherence to the seed which begins to impact seed size and shape. Seed pelleting is the most costly and sophisticated technique that results in the seed changing physical shape to enhance plantability. During any of these processes, fine particulate matter from untreated or treated seed could easily be dislodged causing dust. In order to maintain consistent and high-quality product this dust should be reduced to very low levels. Bayer SeedGrowth™ recently released a case study titled Vital Product and Environmental Requirements for Treaters and Growers which focuses on why quality matters in seed treatment. In the case study Bayer SeedGrowth™ worked with Volkert Meiners, CEO, Meiners Saaten a wholesale seed and seed treatment company to develop seed treatment products that reduced dust-off. Low dust levels are key to successful seed treatment because it allows for better adhesion of the product on the seed and no coating abrasion. Achieving low dust levels is an important step in order to meet stringent safety and environmental standards. 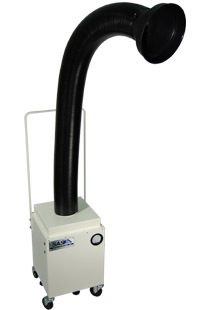 Sentry Air Systems offers various types and configurations of dust collection systems that are both portable and mounted, single- or multiple-operator use with varying levels of suction power. These extraction systems are easy to use and offer source-capture collection to reduce seed treatment off-dust. This source-capture dust extractor features heavy-duty casters for easy mobility, a 5-inch diameter flame-retardant and self-supportive flex arm, a small footprint, and high-quality filtration media. Several filter media options are available for this unit and include: HEPA filtration [up to 99.97% efficient on particles 0.3 microns and larger, ASHRAE filtration [up to 95% efficient on particles 0.5 microns and larger], Activated Carbon, and specialty-blended filter media [i.e. Acid Gas, Mercury, Aldehyde, Ammonia]. Two larger models [SS-400-PFS & SS-450-PFS] and a small model are available [SS-200-FS]. For multiple-operator uses, dual arm and quad arm configurations are also available. This highly efficient industrial air filtration system is an effective ambient air cleaner that removes airborne pollutants without the assistance of external ducting. 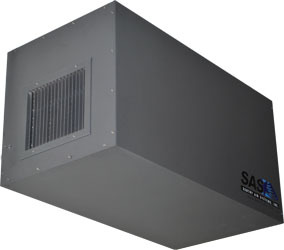 This self-contained unit can be conveniently mounted to a desired ceiling location without taking up any floor space. The dual-stage filtration system is composed of a MERV 7 Pre-filter, which effectively removes particles 3 microns and larger at an efficiency of up to 70%*, while the MERV 14 Main Filter captures submicron particles 0.3 microns and larger at an efficiency of up to 95%*. Portable Room Air Cleaners are also available. For more information on dust control and ambient room air cleaners, contact us today at 800.799.4609, sales@sentryair.com or fill out this feedback form.